In about 60 days, the largest assembly of business brokers in the world will converge in the great city of New Orleans. Without a doubt, this is not only a hot spot to visit (with the finest beignets), but I guarantee you will elevate yourself and your performance by surrounding yourself with other successful peers. I’ve been doing this a long time now, and I still walk away from every IBBA Conference with new ideas, focus and energy. Kudos to our Conference Committee for yet again brining us an outstanding program (and I hear there are some exciting new surprises this year too!) DON’T MISS THIS OPPORTUNITY! Now, I would be greatly remiss if I did not share a few well deserved “thank yous” to those who so generously dedicate their time and talents to making the IBBA a great organization for its members. As this year begins we should give applause and thanks to the Board members that will be retiring after their years of service. From New Zealand, Glorianne Campbell has severed with great skill and honor as a Director, Secretary, and most recently Vice Chair of Membership. Scott Bushkie, our 2016 Chair, also with a term as Secretary, has completed six years of service on the Board and has returned to Green Bay to be with his family. Ron Johnson, a past Chair and the representative of the Past President’s Council to the Board for the last two years, has been a big part of bringing the IBBA and CABB together in membership. John Howe, the retiring Chair of the M&A Source has provided exceptional leadership in the process of reorganizing the operating and corporate structures of both the IBBA and M&A Source. Lou Vescio, last year’s Chair, has led us through a challenging year to achieve some over the top performances in membership and forge new alliances with key vendors to provide more value for our members. This year we have added Bizminer to our benefit package, which adds great value when you’re looking for measurements to better place your new opportunities in the market. Follow that with the introduction of a new E&O insurance program and the recent CapLinked discount, and my annual dues have been more than paid for. This is on top of the continuing benefits we added in 2016 with PeerComps and the Business Reference Guide. As a consequence of these benefits and continuing advancements in education and the Conference experience, member retention is greatly improved. Let me now introduce you to the new Board members this year. Randy Bring (FL) has been a member for over 14 years; serves on the Marketing Committee and is associated with Transworld. Matt Cobb (NC) is the founder and managing partner of Legacy M&A and is leading our Membership Committee this year. Steve Mariani (NC) is the Founder of Diamond Financial Services and for the last seven years Steve has been active with the IBBA SBA lending education and our Conference Planning Committee. He will be the Chair of the Affiliates Council this year and is the current President of the CVBBA. Mike Camerota (CT) is the new Chair of the M&A Source and has been active in the Association for over ten years. We welcome back past Chair, Steve Wain (NJ), as this year’s Chair of the President’s Advisory Council on the Board. These and the other members of your Board will be working hard to deliver the greatest possible benefits to our members for a cost much less than the value of those benefits. Please join me in welcoming all of our Board members, especially our new members. With all of our Committees, there is any army of people too large to individually mention in this article deserving of thanks. Please know that we know and appreciate your works. Course development, the Market Pulse survey, Member outreach and engagement, our learning webinars…none of it would be possible without our volunteers. On behalf of a grateful community, I THANK YOU again. Finally, the IBBA continues to modernize! We just launched a private, member-only Facebook Group to provide you with a new channel for connecting, sharing and deal making. Even to my own surprise, the sign ups have been pouring in. Thanks to our Membership Committee (and the next generation of young brokers) for expanding our horizons. Make sure you join the conversation by ‘Liking’ the IBBA Facebook page, then clicking on the Join Group button. I so look forward to seeing you in New Orleans, and please contact me anytime I can be of service. As to be expected, the SBA released an update to its Standard Operating Procedure that went into effect on January 1, 2018, known as SBA SOP 50 10 5 (J). These updates were extensive as they relate to the change of ownership of a business, whether that be through a c ompletely new buyer coming in to buy a company or through a current owner buying out their partner(s). The new SOP has removed the requirement for a 25% equity injection for processing a loan under a bank’s SBA preferred lender processing authority when the transaction results in more than $500,000 in goodwill/intangible assets. Regardless of the type of change of ownership, the use of Seller Financing in conjunction with SBA financing has historically been a key component to the transfer of ownership. The good news is that Seller Financing can still be used as a mechanism to finance a change in ownership. The bad news is that the SBA SOP update has created a lot of confusion relating to the amount and terms of the Seller Financing. The following explanation will hopefully bring some clarity on the use of Seller Financing under the new SBA rules. For transactions in which an outside buyer/buying entity are purchasing a business, they must buy 100% of the business from the sellers as has always been the case. However, the buyer equity requirements have changed. Now, no matter how large the transaction or the amount of goodwill created, the buyer must inject a minimum of 10% of the entire transaction value. The transaction value includes the business purchase price, any working capital or other requested financing such as new equipment purchase, and any loan fees/costs. Seller Financing can be used as a component of the minimum 10% equity required, but the Seller Financing used for the equity component must not exceed 5% of the entire transaction value (50% of the mandated equity). For example, if the total transaction value is $1 million with a minimum equity requirement of $100,000, the Seller Financing used to count toward the mandated equity cannot exceed $50,000. Additionally, the Seller Financing component of the minimum equity requirement must be on full standby (no payments at all) and fully subordinate for as long as the SBA loan is outstanding. Although we are only two months into these new SOPs, we have already seen deals negotiated with Seller Financing as part of the required equity component. We have also seen structures where the buyers, and the lender, want the sellers to have even more “skin in the game” through a larger amount of Seller Financing. Having additional Seller Financing is allowable, but it must be a separate note and be included in the debt service coverage calculation as it is now considered debt. Every SBA lender is going to view this additional Seller Financing differently, so that’s where the creativeness can come in to the transaction. If there is plenty of cash flow to service the SBA loan and the additional Seller Financing, it’s possible that the lender will allow payments to start immediately after the closing of the transaction. At the same time, some lenders may take a more cautious approach and want to see a year or more of adequate debt service demonstrated before payments on this additional Seller Financing can commence. Regardless, the lender will have the ability to restrict payments on the additional Seller Financing at any time. For transactions in which an existing owner is buying out their partner(s), the selling shareholder must sell 100% of their position. In this instance, however, it is necessary for there to be a minimum of 10% balance sheet equity for the company on a pro forma basis taking into consideration the new SBA loan used to buy out the partner(s). The selling shareholder(s) may provide Seller Financing as long as there is still the required balance sheet equity on a pro forma basis. If the Seller Financing is being used for the pro forma balance sheet equity requirement, it must be on full standby and subordinate for the life of the SBA loan, and it must not exceed half of the equity required. If there is not enough balance sheet equity on a pro form basis and the selling shareholder(s) is not willing to provide Seller Financing, the remaining owner(s) must provide an equity injection that results in a minimum of 10% pro forma balance sheet equity. The key takeaway is that Seller Financing can and will continue to be a vital component to structuring and closing change of ownership transactions. As long as the minimum SBA SOP requirements are met as reviewed above, there can be some creative negotiations among the buyer, seller, and lender. If you are seeking a creative SBA bank, or just want to discuss a potential deal structure, please contact one of our lenders to help you through the process. Join Ed Pendarvis and Edmond Legum for a webinar designed to help you to be successful by helping your sellers & buyers to be successful. A Business Broker adds great value to the step-by-step process of listing, valuing, marketing; negotiating on, financing, doing due diligence on and closing the business sale. When the Buyer succeeds in buying – the Seller succeeds in selling – the Business Broker succeeds in their professional services too. Purchasing an established business can be a daunting and complicated process for many individuals. Understanding the steps involved in the acquisition and doing the necessary planning and preparation will enable the buyer to increase their chances for a successful transaction. Following an established and proven process will not only reduce the stress that often comes with chartering new territory but also eliminate many of the risks and unknowns that often derail a business acquisition. Do you have business categories that you know you are not interested in such as franchises, retail or food service? These are a few of the questions that will help an individual assess the types of businesses that they are best suited for and assist in narrowing the range of enterprises where the buyer’s skill set, experience, capabilities and passions can be leveraged. If you plan to use bank financing to acquire a business it is important that you obtain a prequalification at the beginning of your search process. Not only will the ‘prequal’ provide you with the data as to how large of a business you qualify to purchase, but it will also demonstrate to the business broker and seller that you are a serious buyer. If you are sincere about buying a business and require financing, receiving a bank prequalification is going to be a required step at some point in time. Therefore, what would be the reason for procrastinating and not having this in place at the outset? There is zero downside and only considerable benefits. Contact your business broker as they will be able to recommend a financial institution that does business acquisition lending for the type of business you are interested in purchasing. This is an area where having the right lender is critical. A business that is professionally represented for sale will have a number of documents available for review by prospective buyers (e.g. Financials, Asset list, Business Summary (CIM), etc). Buyers will need to execute an NDA (Non-Disclosure Agreement) in addition to demonstrating that they are qualified both from a financial standpoint as well as an experience standpoint to be considered a serious candidate. At this stage the buyer should already have completed individual research or have first-hand knowledge on the industry. For those without direct industry experience there are trade magazines for just about any business sector not to mention the wealth of data available online. The buyer should have a list of questions already prepared, designed for one purpose – determining if the business meets the majority of the investment criteria. The buyer should understand the value of the business. If the business is priced outside of their financial ability they should not be evaluating the business and wasting anyone’s time, most importantly their own. It will be important for a serious buyer to recognize that there is no such thing as a perfect business and each will have different strengths and weaknesses. Most buyers are seeking businesses with growing revenue, a stable customer base, excellent staff, established policy & procedures, and increasing profits. What are the most important qualities that you are seeking? Ranking the criteria is often helpful when qualifying businesses. Finding a business which meets some but not all of the criteria is more the norm than the exception. In many cases, the buyer may be positioned and experienced to improve certain business aspects that are deficient. Following this approach will also enable the buyer to quickly and efficiently eliminate those businesses which will not be a suitable fit, an endeavor that will save all parties considerable time. A quick no is far better than a slow no for everyone’s sake. Lastly, the buyer should recognize that the better the business is, the more they will be expected to pay. After the initial information exchange the buyer should prepare a second set of questions based upon the particulars of the specific business. After receiving this information, the time has been reached where the buyer knows whether their basic criteria has been met. The buyer is clear on the business valuation, the financials, and the business operations and the seller (through the broker) should be clear on how the candidate will be financing the transaction. A teleconference should be arranged by the business broker to fill in any gaps of information and to allow specific business questions to be asked by the buyer and answered directly by the seller. Should this interaction satisfy the requirements of all parties a personal meeting and site visit is often arranged. During this meeting the buyer, seller, and broker can discuss the framework for a transaction that will satisfy the needs of each party. Only serious contenders should be involved at this point. Now is not the time to waste anyone’s time as a tire-kicker if the goal is not to proceed. Buyers should understand that regardless of signing the NDA, data such as names of specific clients will not be divulged, not just at this point, but until the transaction closes. A Letter of Intent (LOI) and Terms Sheet are typically non-binding documents which are used for one fundamental purpose…to determine if there is a meeting of the minds between the buyer and seller on the price and high level terms of the sale. The LOI will outline the strategic points of the agreement. Investing time at this stage and preparing a fairly detailed document will avoid misunderstandings and prevent key terms from being renegotiated later. In most transactions the DPA is executed at the closing table but this is not a requirement. In certain circumstances, the buyer and seller will elect to execute this Agreement prior to the actual close (when the transaction is funded). The DPA is the actual contract that consummates the sale of the business. It will include a number of Schedules and Exhibits detailing all of the terms of the sale. This is a custom Agreement and the level of detail, length, and companion schedules and attachments will be determined by the size and complexity of the particular business. During this stage the buyer should already have their new business entity established, business bank accounts created, insurance policies prepared, merchant credit card accounts (if applicable) in place, etc. The closing should be the easiest part of the process. Why? Because all of the above steps have been followed diligently by both parties. For business-for-sale transactions the “closing” is simply the process where the buyer and seller execute the documents that have already been discussed and agreed upon and the funds are transferred to the buyer. Having the right transaction team in place from the start (transaction attorney, business broker, and lender/loan packager) will make this a smooth process. Each of the advisors has their role and when done properly the closing becomes an uneventful (final) step. The terms and conditions of the business transition will vary based upon the type and complexity of the individual business. Obviously, the specifics will have already been spelled out and agreed to in the DPA. For some businesses, a 2 to 4 week transition period is all that is required. For others, the Seller will assist for an extended period of time, often under an employment or consulting agreement. When bank financing is involved, especially if an SBA guarantee is attached, the Seller may be restricted to a consulting or employment contract that does not extend beyond 12 months. The transition period is the stage where the seller and new owner implement the change of ownership and how that is communicated to employees, customers, suppliers, etc. The transition of ownership represents a big change and the goal is often to make it as seamless as possible. To be effective, this process must be planned in advance with all stakeholders in agreement. For many individuals the acquisition of a business will be one of the largest commitments they will make in life. Following a structured process will be one of the key components to ensuring a successful outcome. Michael Fekkes is a Senior Broker at ENLIGN Business Brokers in Nashville, TN. Michael is a Merger & Acquisitions Master Intermediary [M&AMI], Certified Business Intermediary [CBI], Chairman of the International Business Brokers Association [IBBA] – Communications Committee, as well as a former business owner. He can be reached at910.691.2202 or [email protected] –ENLIGN Business Brokers is a Professional Services Firm serving the Southeast that is headquartered in Raleigh, NC providing business intermediary services ranging from valuation and sale to exit & succession planning strategies. 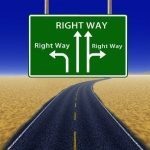 Valuing a Company for Sale – Is There a Preferred Method? I was asked the question on whether one valuation approach (or method) was preferred over another when it came to the acquisition of a business. The question came up because they had never run across a buyer of a business using the Income Approach to value a target company. So, this begs the question, is there a preferred approach when it comes to valuing a company for sale? Company for Sale = Rely on the Market Approach Right? Appraising real estate and businesses follow almost the same exact process to arrive at a conclusion of value but the information used to arrive at that conclusion is very different. When looking to buy a home that’s listed for sale, most people first look to what other homes in that area have sold for as a reasonable starting point. Every single home in that area that has been sold can easily be found by doing a quick search of local tax records. So, when negotiation takes place, real estate appraisers will rely on these records as the basis of supporting their listing price. So, when trying to determine the value of a business, what better way than to seek comparable businesses that have sold – right? Not really…. There is one main difference between real estate comps and business comps – REGULATION. When you sell a home, that transaction is required to be recorded and made available to the general public through tax records. When you sell a business, there are no such requirements, so not every business that has sold has been recorded and for those business transactions that are available, the data is inconsistent at best. In theory you could argue that since 100% of business transactions are not being recorded and cataloged somewhere, the data that is available does not adequately represent the market as a whole, rather just a small portion of it. Because of this, does it really make sense to place 100% of your confidence in data from business transactions where there is no regulation of reporting it? Probably not, and that’s why it’s rare to see business appraisers allocate 100% weight to the Market Approach. 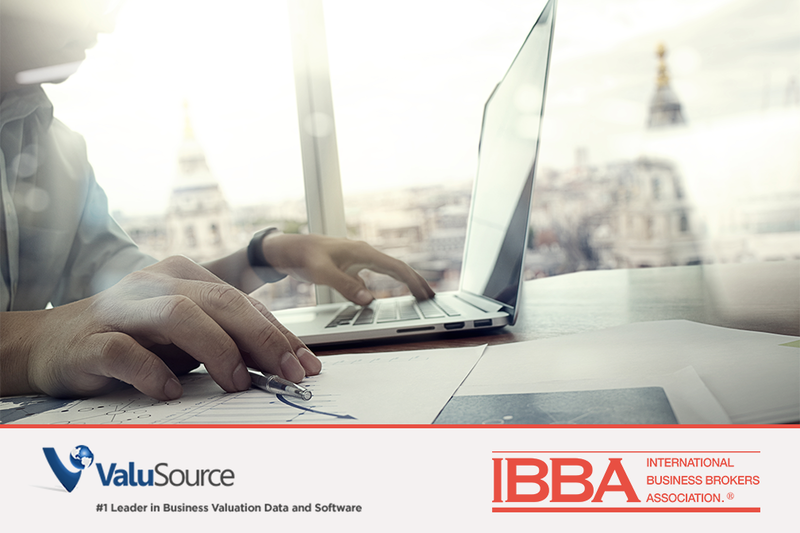 Business appraisers are required to consider 3 approaches to value; Cost Approach, Market Approach, and Income Approach. Companies heavily invested in assets are usually regulated to the Cost Approach, so you won’t see that used to often in business valuation. We’ve already discussed the Market Approach, but what about the Income Approach. As an appraiser, I’ve always conformed to the theory that value can be defined by the present value of future economic benefits. So, when it comes to the sale of a business, value to a buyer is driven from 2 key variables; Cash Flow and the Risk associated with that cash flow. That’s the Income Approach. When you really think about this, it’s a simplistic approach to value just as relying on real estate comps to estimate the value of a home. Nothing wrong with being simplistic. Having said that, the Income Approach is also very subjective, mostly in the risk category. Every person has a different viewpoint of perceived risk when it comes to a business, especially those who have a vested interest in the sale of that business. This can be a little tricky since every business is different. So, the Capitalization Rate (or Discount Rate), which represents the risk in this equation, can be different from one person to the next. If you’ve ever run across a valuation report that concludes a ridiculously high value, you can almost bet the value was based on Discounted Cash Flow; one with unrealistic growth in cash flow against a very low (risk) discount rate. This, however, usually comes from individuals who have a vested interest in the subject, or someone who lacks experience with M&A Transactions. The Income Approach is not a perfect approach to value but if done right, it’s the most accurate in my opinion. As mentioned earlier, there are three valuation approaches; Cost, Market, and Income. All are equally important and should be considered in every valuation engagement. If asked whether or not I use one over the other, my response is that I have no preference and will always use the approach I have the most confidence in. Sometimes that’s one approach, sometimes it’s a combination of 2 or all three. Having said that, in those times where I have allocated 100% of my confidence to one approach, it’s almost always to the Income Approach and rarely to the Market Approach. Did Your Seller Prepare to Exit? If Not, Can You Help? Every quarter, Business Brokers are asked a series of detailed questions about the businesses they sold the prior quarter. 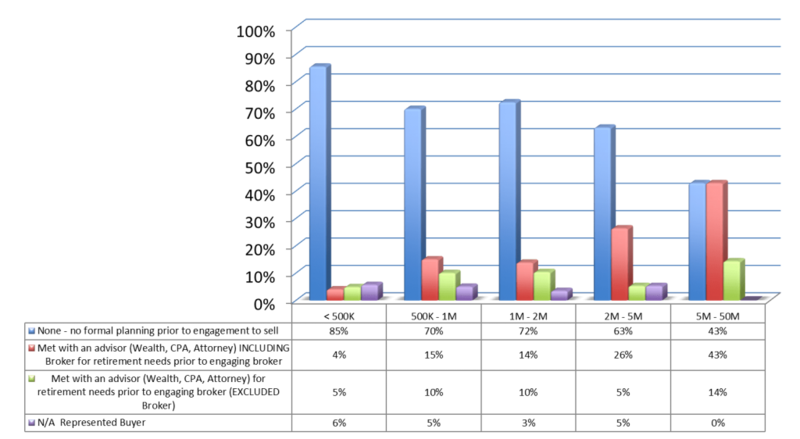 New to the quarterly Market Pulse* report in 2017 Q4, the intermediary reported on whether the Seller had any type of formal planning prior to engagement and the length of time they spent on exit planning prior to marketing the business for sale. Of businesses that sold in 2017 Q4, most owners did NOT plan for their exit prior to selling their business. The vast majority reported that the Seller had no formal planning prior to engaging the Business Broker/Intermediary to sell. In fact, 85% of businesses which sold for less than $500,000 had not talked with anyone. Those with the most planning were in the Lower Middle Market. However, less than 15% of brokers reported that the Seller, regardless of size of business, had met with any advisor prior to engaging the Broker. A significant minority, especially those working in the lower middle market (26% and 43%, respectively) either introduced a team of advisors or worked with the Seller’s Team. Of the Sellers who do plan ahead, most are still moving through the exit planning process at a rapid pace, with less than a year between initial consultation and the Broker taking the Business to market. Only in the lower middle market, with businesses valued between $5 million and $50 million, do advisors report a meaningful number of sellers (29%) planning at least two to three years out. That still means that 71% of business owners are leaving a multimillion dollar event up to chance. In an ideal world, Brokers want to connect with sellers three or more years ahead of a sale, especially in the lower middle market. That gives Sellers a reasonable amount of time to make meaningful changes to financial issues like working capital and separating the discretionary (e.g., Ferrari) expenses from true business expenditures. 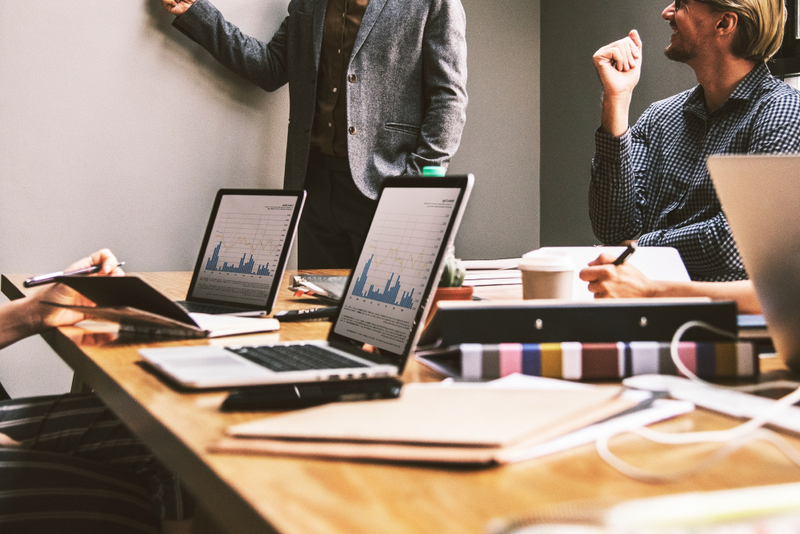 It is also about the minimum amount of time necessary for Sellers to develop key employees and shore up their leadership and/or management team, get their Advisory Team in place, and identify the tax consequences of the sale. 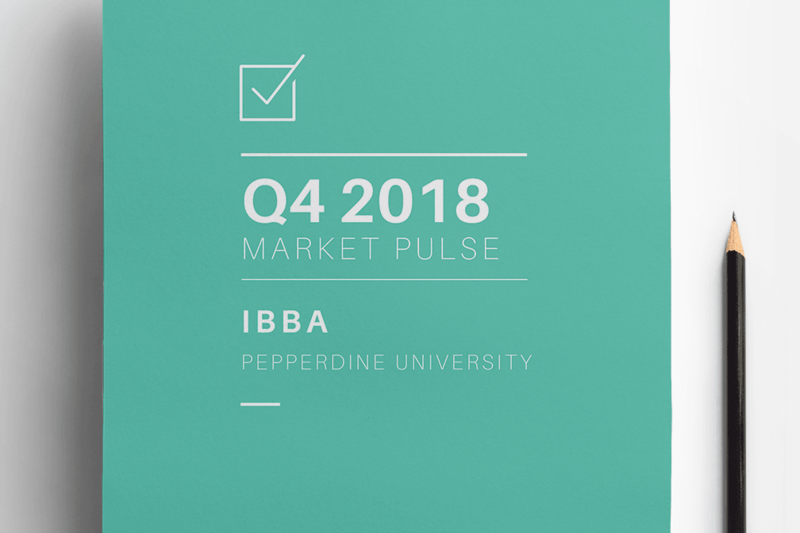 * The IBBA and M&A Source with the support of the Pepperdine Private Capital Markets Project and the Graziadio School of Business and Management at Pepperdine University has conducted quarterly Market Pulse Reports since Q2 of 2012 to gain an accurate understanding of the market conditions for businesses being sold in Main Street (values $0-$2MM) and the lower middle market (values $2MM -$50MM). For the most recent and prior reports, please go to: https://www.ibba.org/resource-center/industry-research/. We invite you to join the IBBA Facebook Private Group! Use this tool to communicate with your peers to get conversations started and get engaged! Like the IBBA Facebook page. Request to join the IBBA Private Group. Once approved, start a conversation! Welcome to 100+ New Members that joined the IBBA since December 1, 2017! We’ve added a 2018 Spring Educational Summit in April due to high demand! It will be held in Cleveland, Ohio on April 8-10 and will offer courses #210, #220, and #221. Registration is open now! The 2018 IBBA Annual Conference will be held in New Orleans, LA on May 4 – 7! 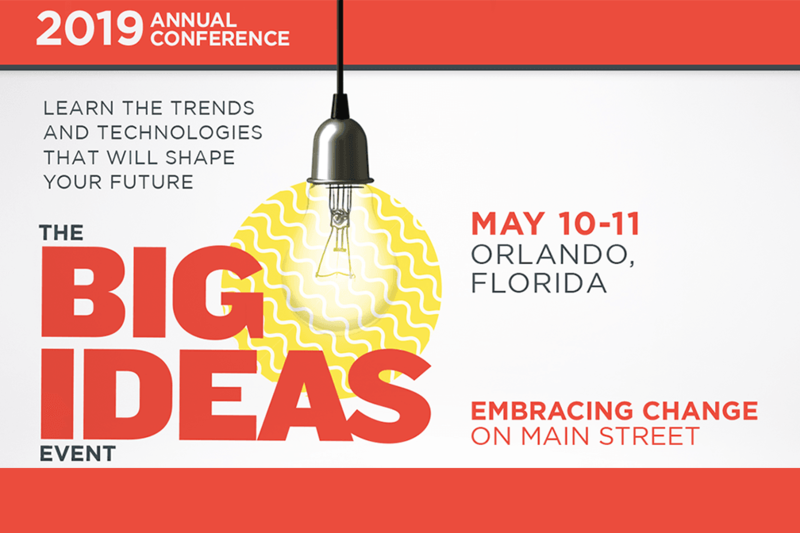 Register now and join us for The Awards Dinner, The Main Street Marketplace, Workshops, Masterminds, Courses and more.